Share with someone else in your congregation your experience with Religion in Life. This could be by informally talking, through a newsletter or website article, on a poster or slide show during coffee hour, or even by talking to the whole congregation as part of an awards ceremony. 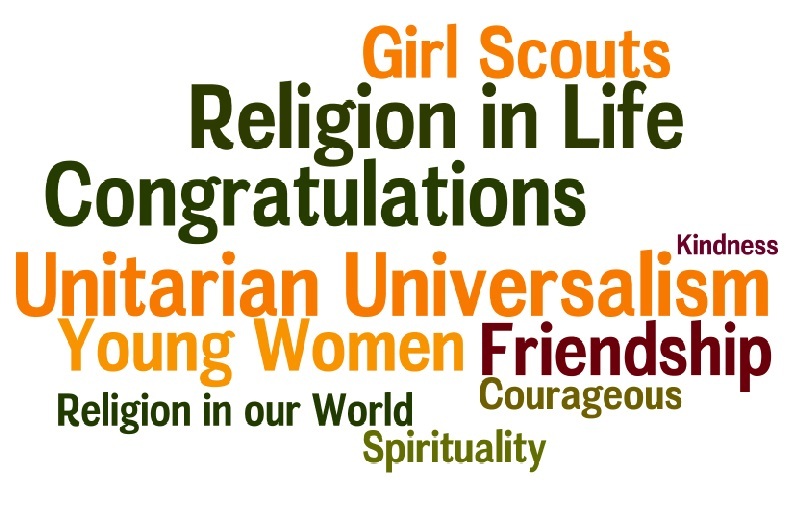 Please fill out a Religion in Life for Girl Scouts Participant Survey. The UUA’s Faith Development Office greatly appreciates any feedback on programs. …on finishing this program—now celebrate your success! If you are to be formally presented with your award in your congregation, consider inviting some of your Girl Scout friends. Create your own Word Chart here: http://www.wordle.net/create. The more words you type into the box, the larger the word will be in your Word Chart. More than one word (Religion in Life) requires a ~ in between the words (Religion~in~Life). You can print your Word Charts and hang them in the meeting space where you meet for Girl Scout activities. Have fun!